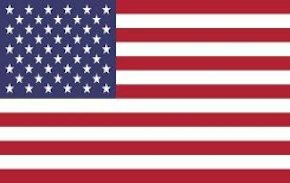 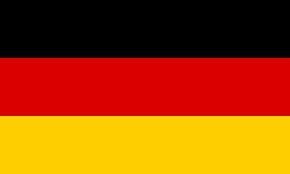 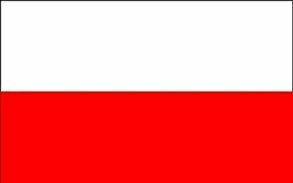 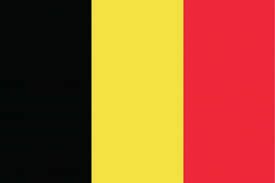 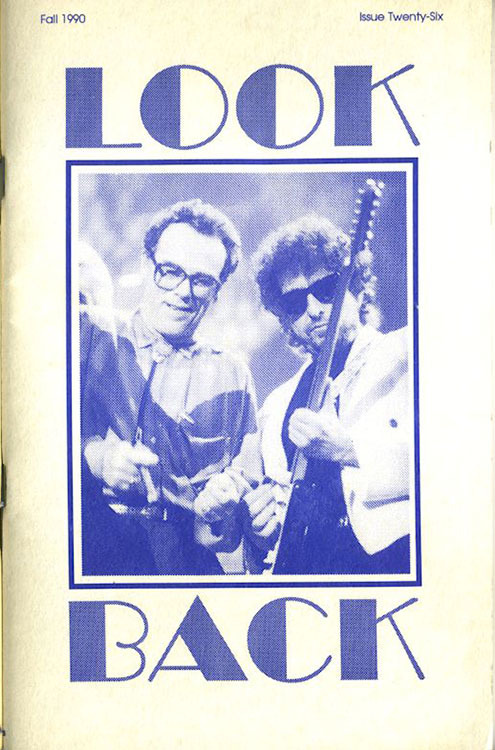 LOOK BACK, USA, 1984 -1993. 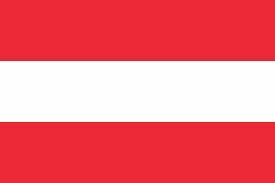 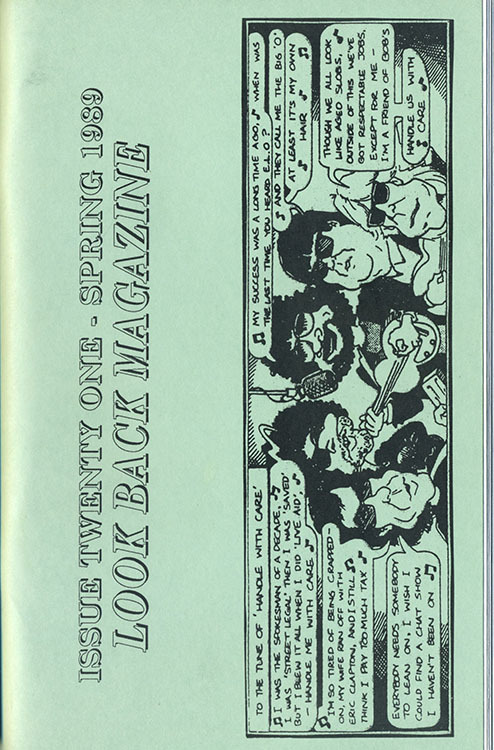 The editors, at least at the beginning, were Mitch Barth, Richard Hager, Lori Ann Northway, Jane Simpson, Mark Laren and Al. 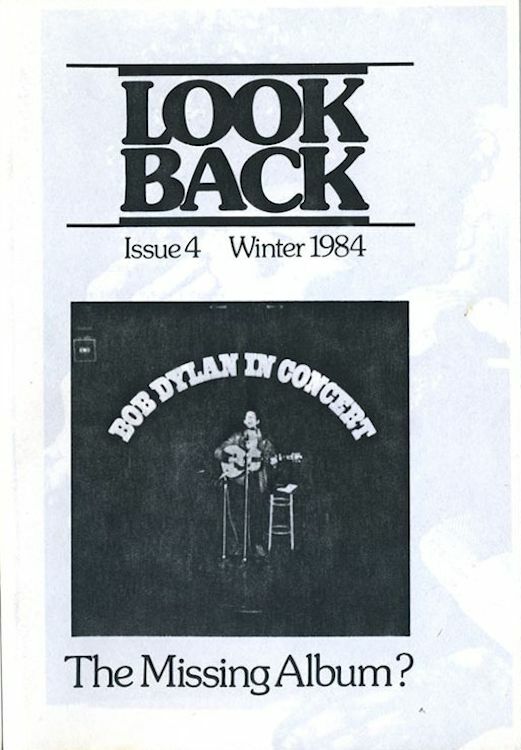 The size of the fanzine changed several times: the first two issues were A4, then A5 till issue #30, and back to A4 again for issue #31 and #32 (Spring 1993). 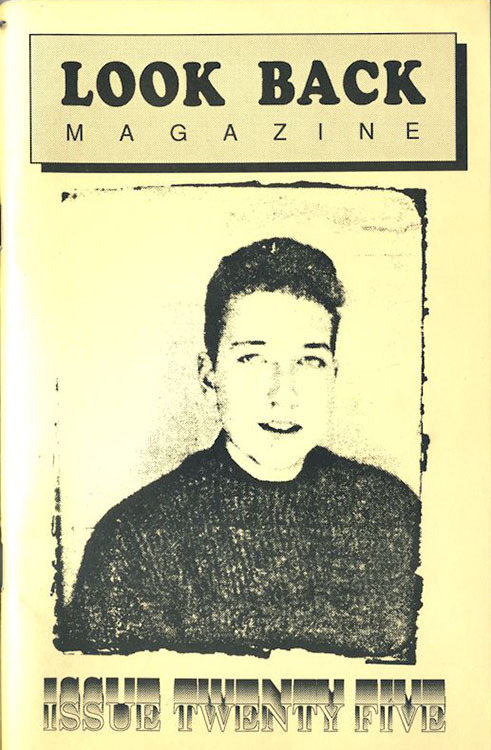 On issues #8 to #15, a photography was stuck on the cover. 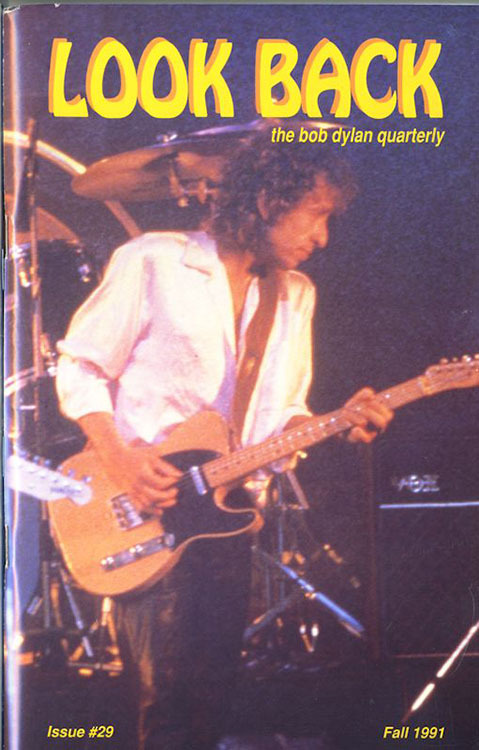 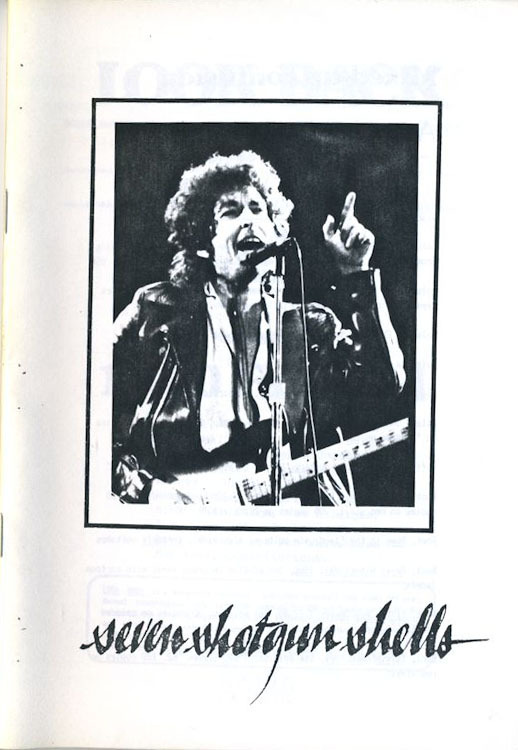 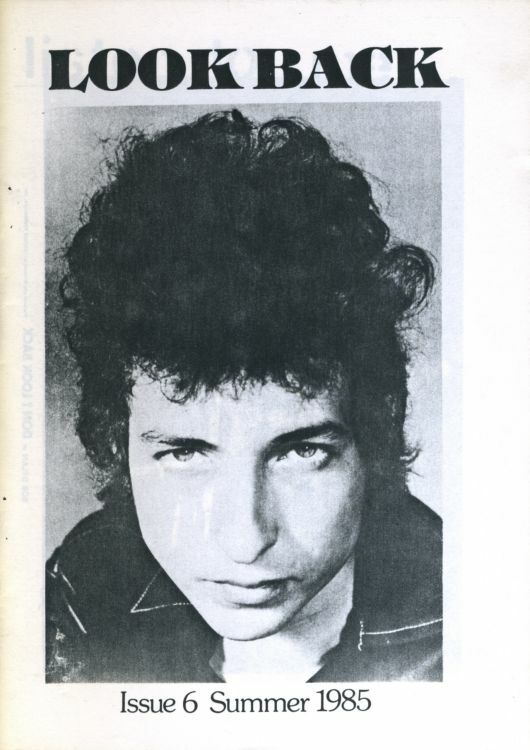 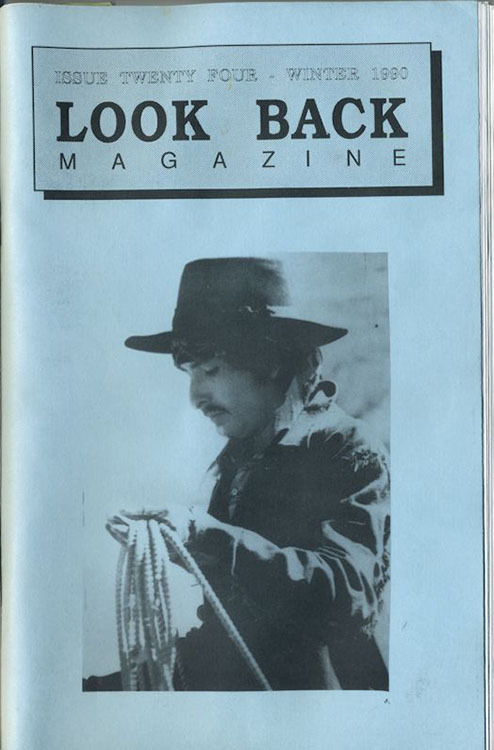 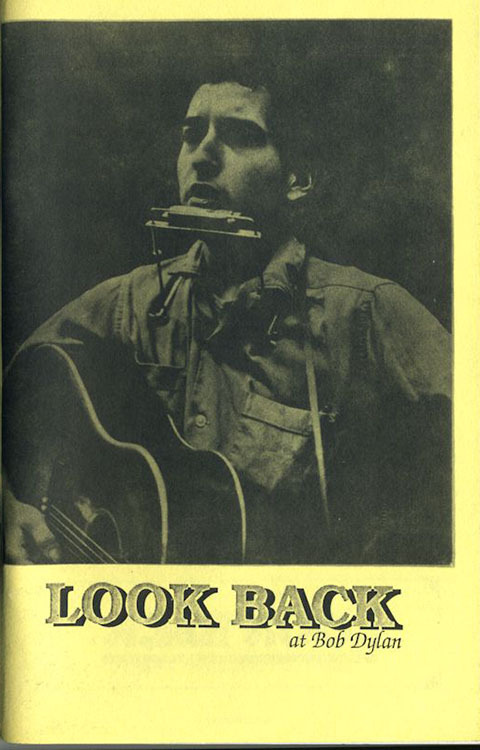 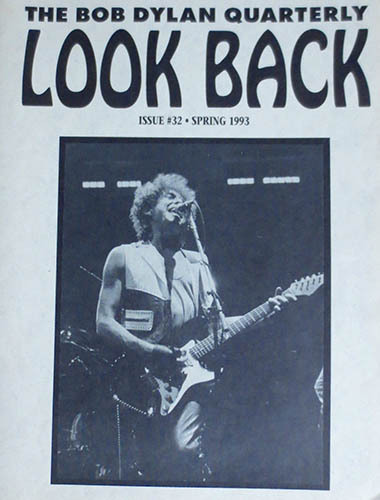 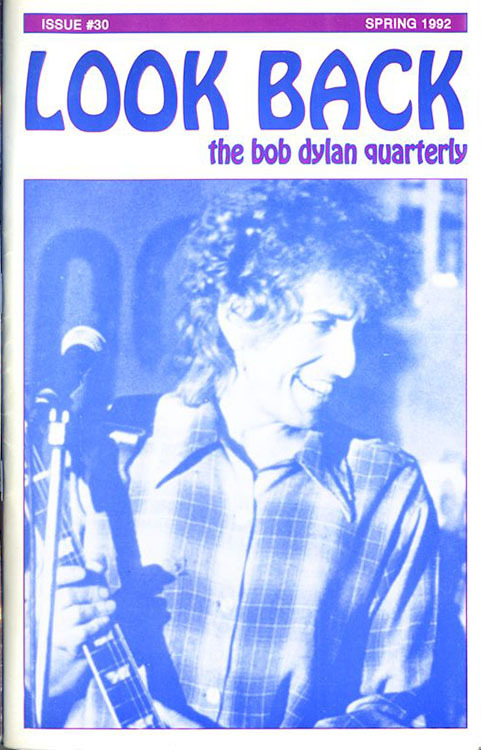 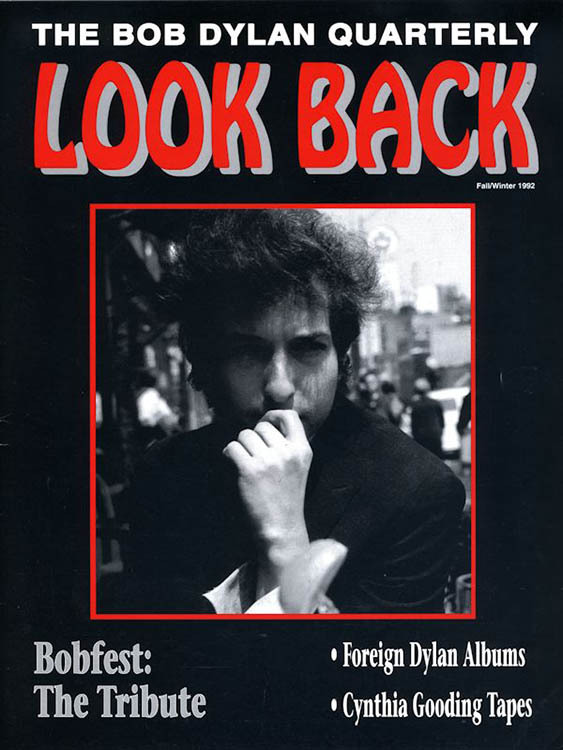 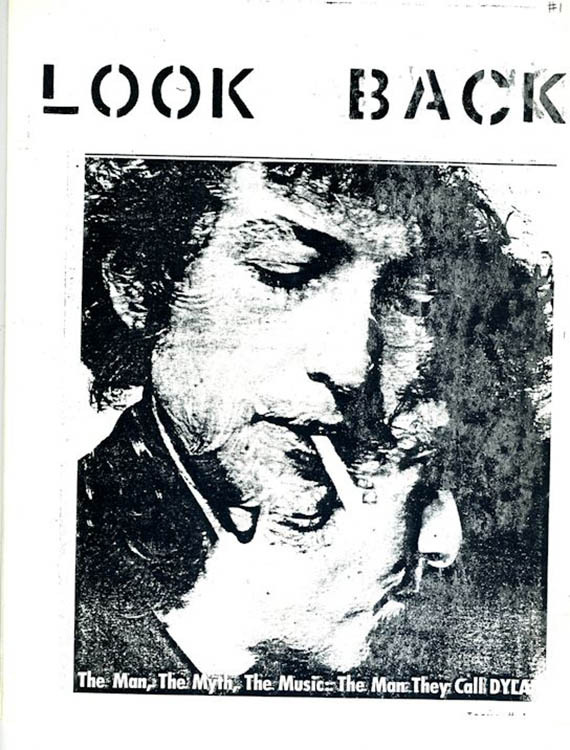 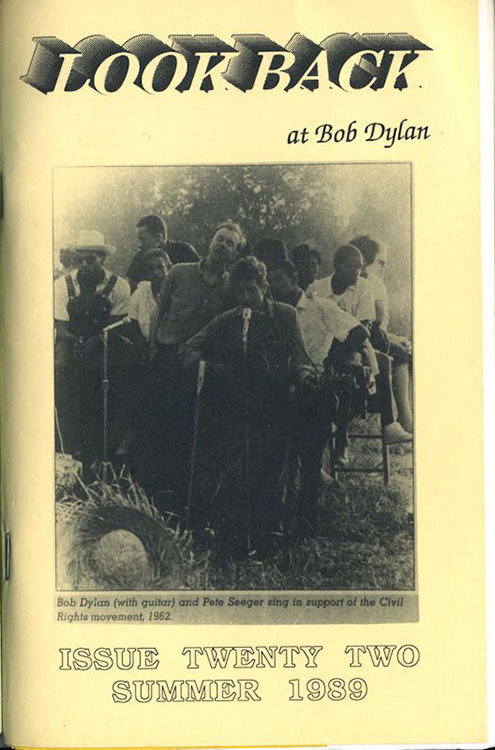 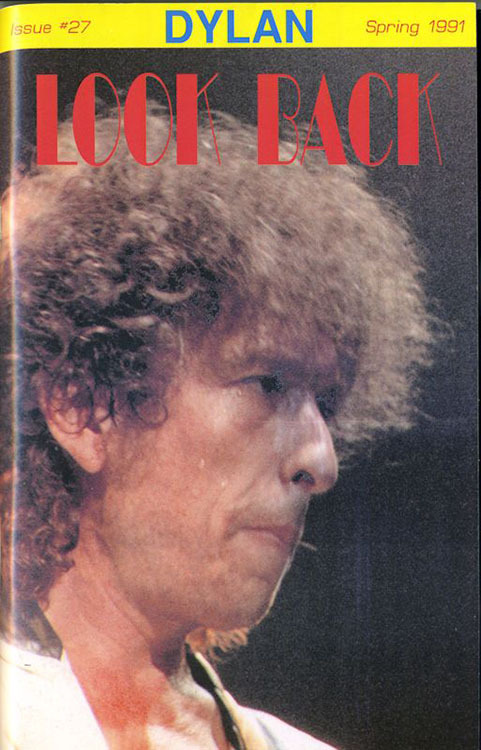 From #28, the title became LOOK BACK, THE BOB DYLAN QUARTERLY. 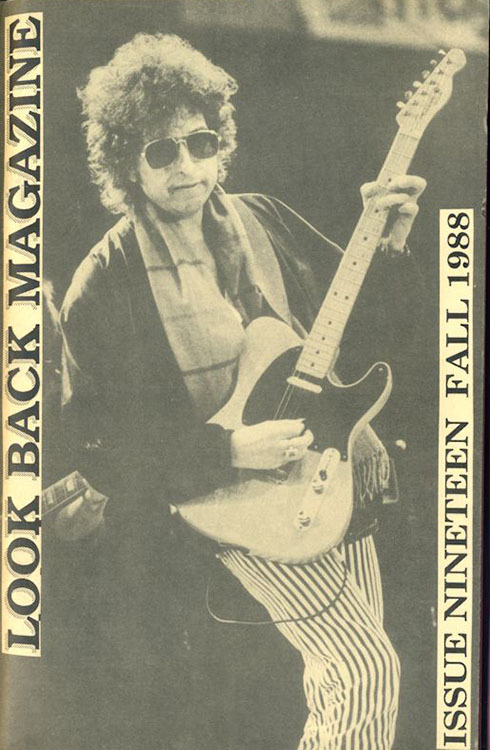 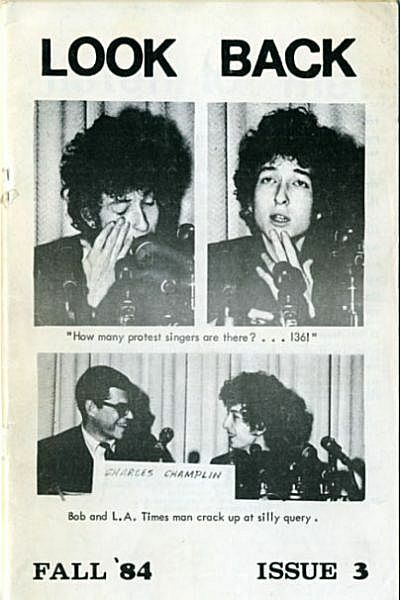 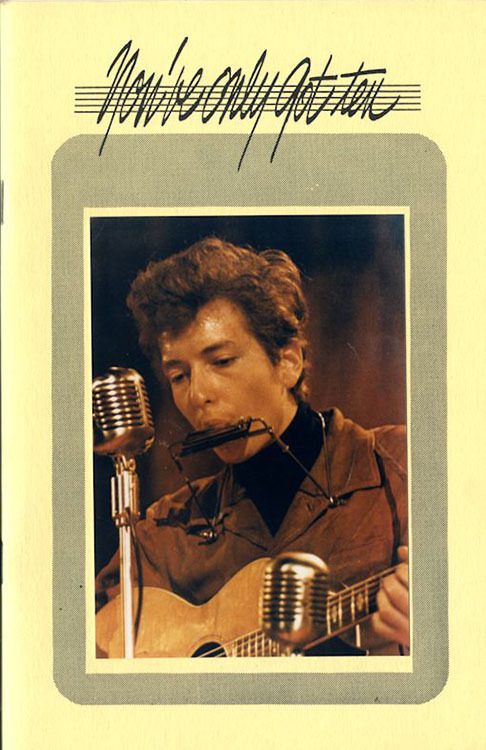 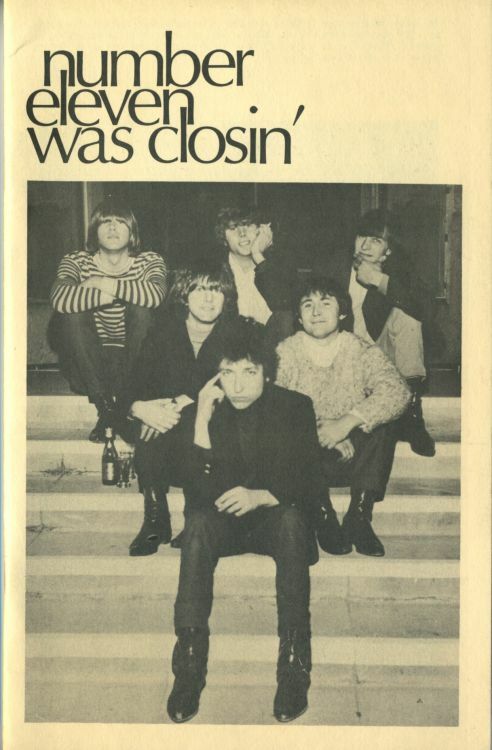 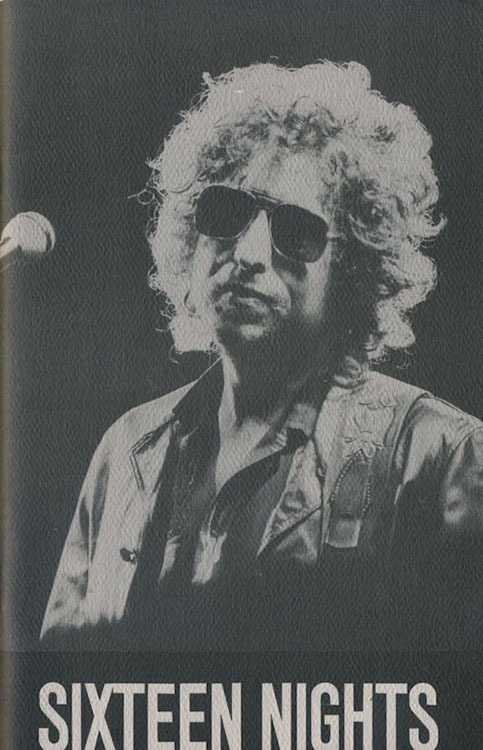 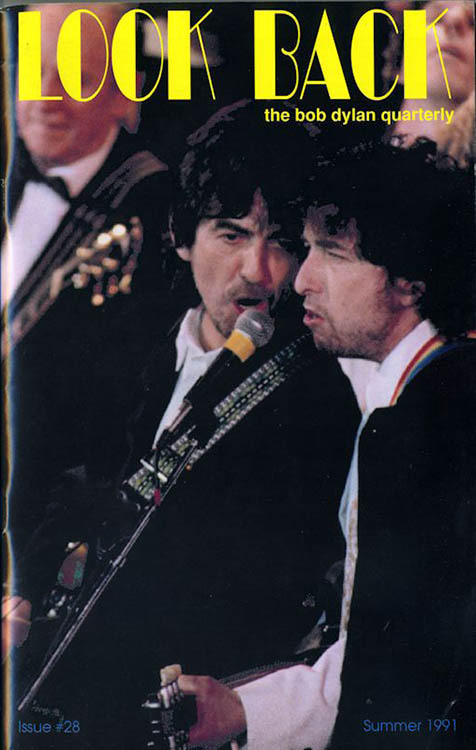 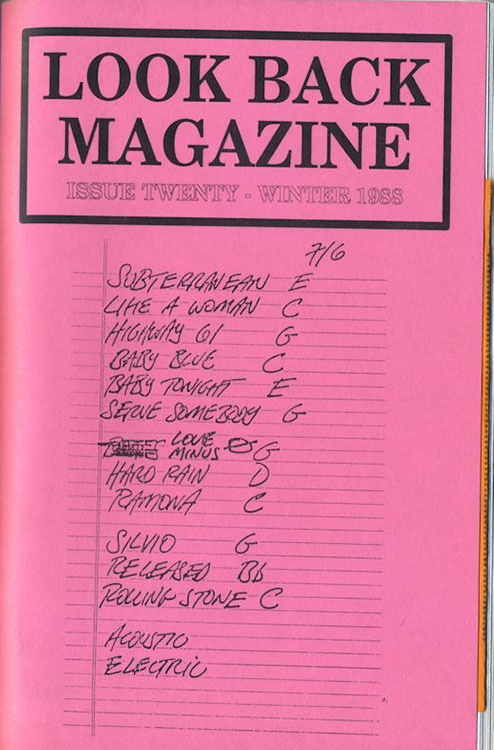 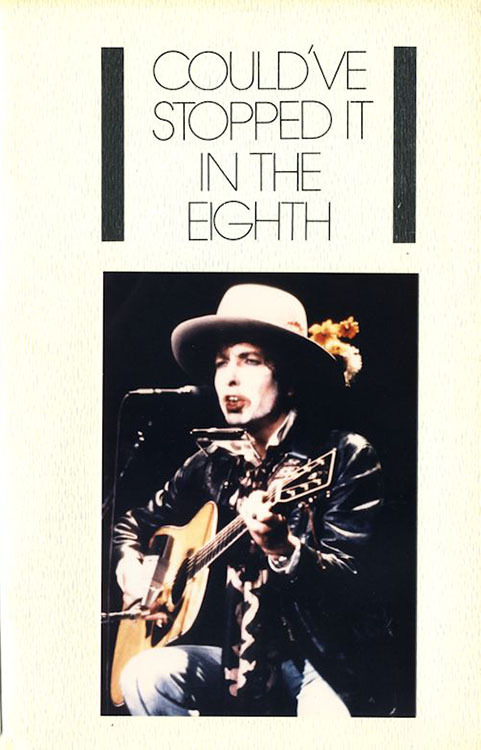 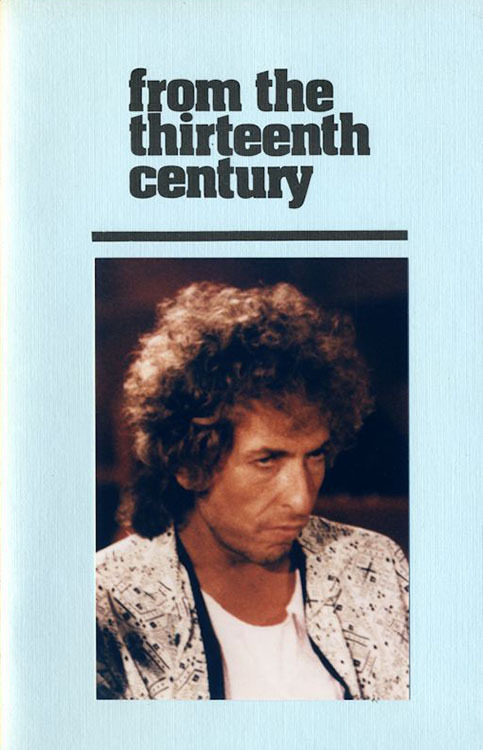 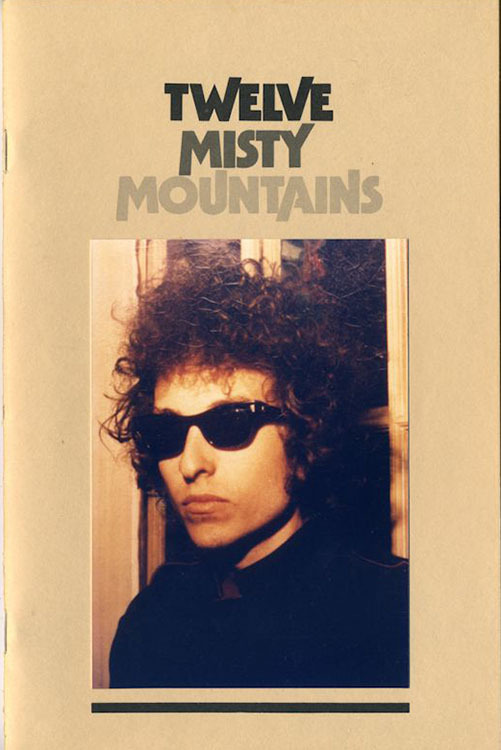 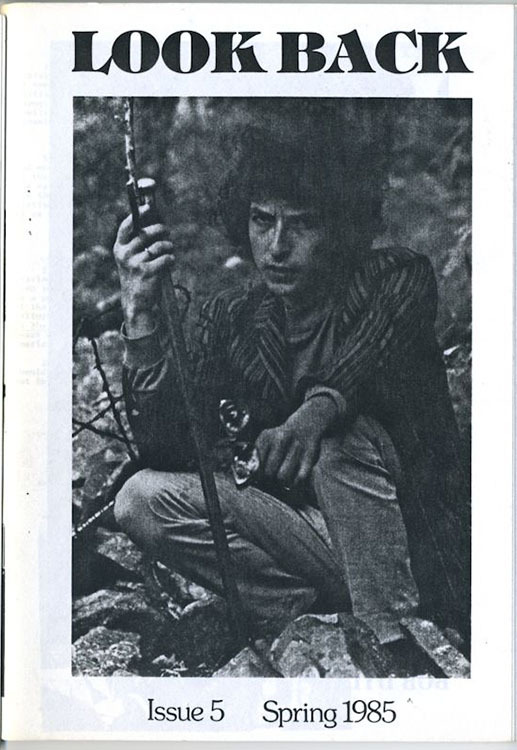 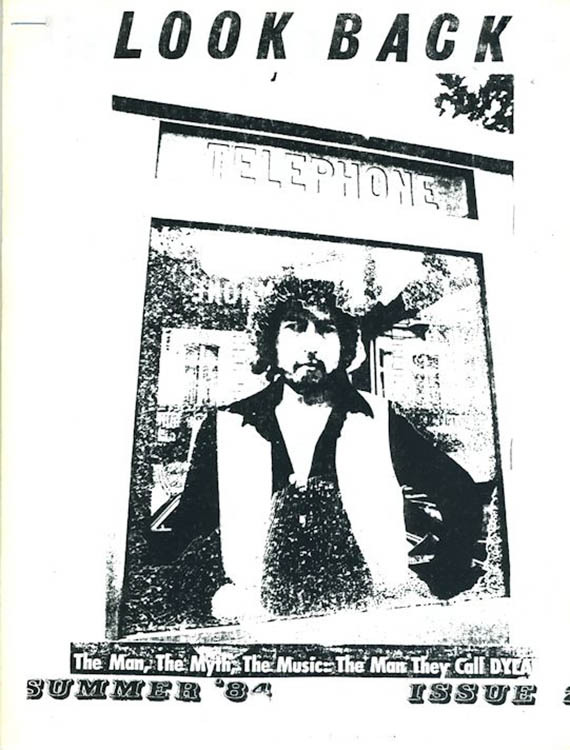 From issue #7 till #17, a good idea was to take for title a Dylan quotation related to the issue number: there were 'Seven Shotgun Shells' (#7), 'Could've Stopped It In The Eight' (#8), 'A Cat She's Got Nine Lives' (#9), 'You've Only Got Ten' (#10), 'Number Eleven Was Closin' (#11), 'Twelve Misty Mountains' (#12), 'From The Thirteenth Century' (#13), 'In Fourteen Months I've Only Smiled Once' (#14), 'Fifteen Jugglers' (#15), 'Sixteen Nights' (#16), and 'On The Seventeenth' (#17). 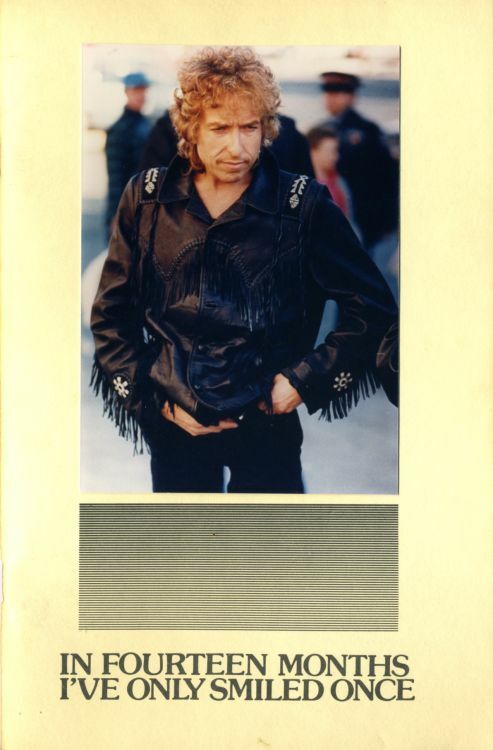 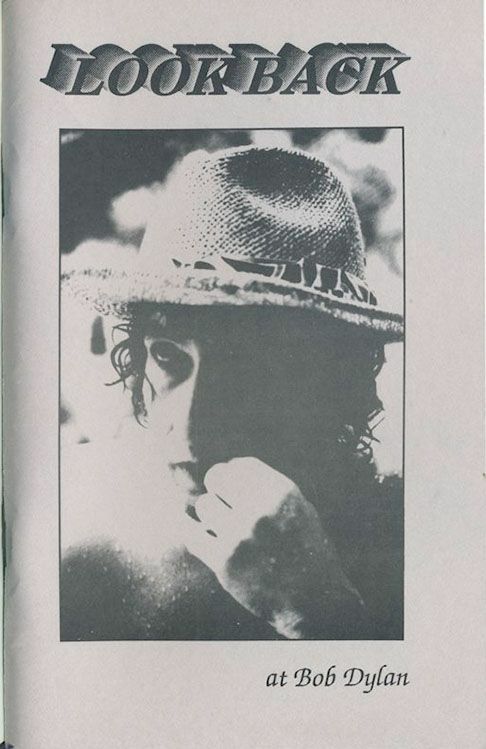 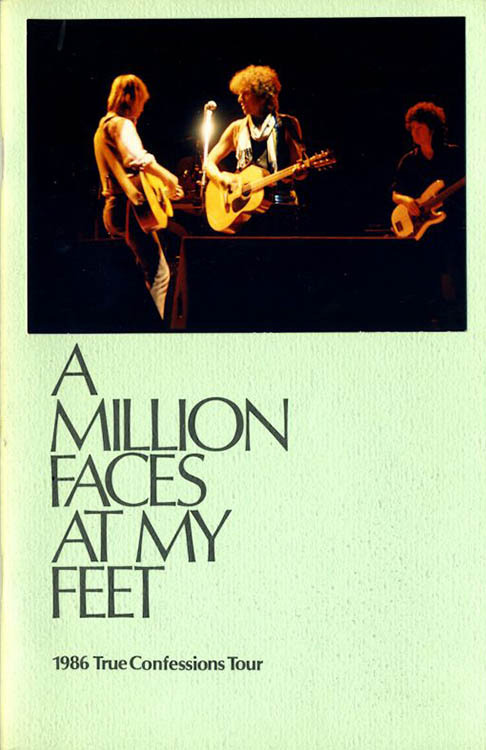 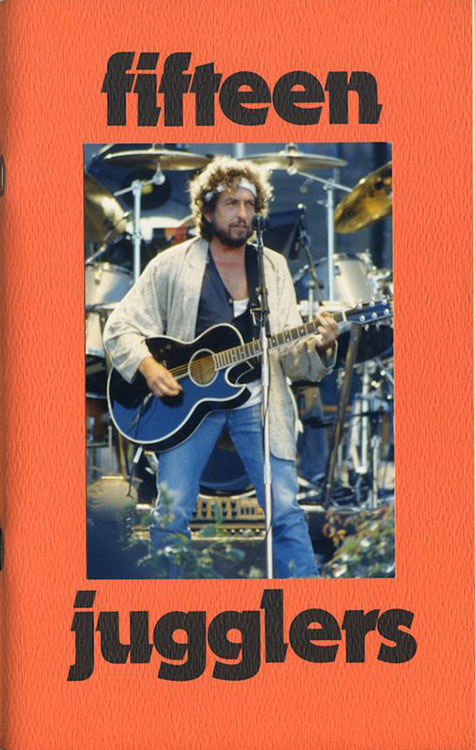 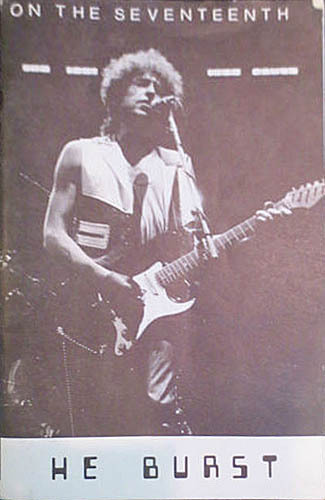 A booklet, or special issue without any reference to LOOK BACK, was published fall 1986: it is called A MILLION FACES AT MY FEET - 1986 TRUE CONFESSION TOUR. 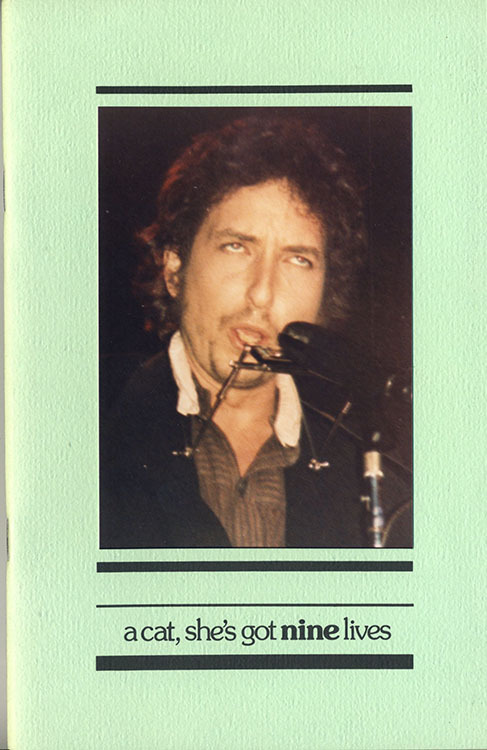 Special issue / booklet (Famous Etiquette Book).